Chris Dodd, former rowing correspondent of The Guardian, remembers his longtime friend and collaborator, Jim Railton, the coach and journalist who has recently died. Jim Railton, who died aged 81 on 16 August after a long illness, was a talented coach and a sharply perceptive rowing correspondent, with a searing sense of humour that he applied to both activities. Born in Liverpool – his father Robert Arthur Railton was a communications officer in the Royal Navy and his mother Florence was a business woman – Jim attended Dovecot Junior School and Liverpool Collegiate School before graduating in modern Jazz at Loughborough Colleges (now University). He was also a fleet-footed international class sprinter. He became a PE teacher before joining the Amateur Rowing Association as a trainer in the 1960s. While at the ARA as its first professional, Jim answered an advert for an unpaid coach at Thames Tradesmen RC to learn the rudiments of rowing. He produced a Tradesmen four (Bill Mason, Lennie Robertson, Jim Clark and Fred Smallbone) that not only rowed with fluidity but became GB’s leading crew. He resigned as trainer when Bob Janousek was hired from Czechoslovakia as the ARA’s first professional coach at the end of 1969, but Jim continued to coach his four. Much of his coaching was unconventional. He took videos of outings at Wallingford and played them back to a sound track of the Marx brothers. Tradesmen were soon winning regattas and, in the early 1970s, the Head in a composite with Leander. They were the rebels of the day, challenging conventions and often rubbing team managers up the wrong way with their long hair and substitution of thigh-hugging cycling shorts instead of the team-issue baggy rowing shorts. The real irritant was that these cocky, no-nonsense apprentices and teachers became, along with the double scullers Chris Baillieu and Mike Hart, who were equally opinionated Cambridge Blues, the most successful unit in the GB senior squad. When Janousek handpicked a small squad in late 1973 to mount an assault on Olympic medals in Montreal three years later, the Tradesmen four (and the two scullers) were absorbed into it, and went on to win silver medals at the 1974 Worlds and 1976 Olympics, putting Britain back onto the Olympic podium after many barren years. By now, Jim had succeeded Doug Calder as rowing correspondent of The Times, bringing insight, constructive criticism and some coruscating prose to the sports pages. Shortly before this I had became The Guardian’s rowing corr, and we became occasional collaborators and great friends. Pointedly, we brought a bit of investigative journalism to the old school of national press rowing correspondents by writing features and interviewing athletes and coaches instead of relying too much on rating watches and the critical study of style. We often travelled to regattas and world championships together, and there was seldom a dull moment in his company. For example, on the first evening of the first Nottinghamshire International Regatta, we made the acquaintance of Squadron Leader Stamford in the hotel bar. Stamford had been in his new job as director of the ARA for but a few days, and had never set foot into a rowing club as far as we could tell. The conversation on the relationship between the press and the governing body, fuelled by alcohol, polarised to a confrontation in the small hours, with Stamford maintaining that any publicity was a hindrance for the governing body while we argued that the ARA owed its very being to the likes of us. I left them to it at about 3 a.m. Next morning, I picked a two-seat breakfast table where I sat feeling like death as I sipped a black coffee and buried myself behind a newspaper. The squadron leader then appeared and asked if he could join me, and I gestured to the vacant seat while continuing to read. He ordered breakfast and then inquired where I obtained the paper. ‘From the lobby downstairs,’ I replied. At this point the waitress arrived with the squadron leader’s Full English, and plonked it in front of Jim. ‘The service is good, here, isn’t it,’ said Jim, raising his knife and fork. I couldn’t say anything, so I said nothing. ‘I’d better start again,’ Stamford said, and wandered off. In 1979, Jim and I island-hopped through the Adriatic after the world championships in Bled. At that time, he was British agent for a well-known boat manufacturer, and his commission for the year was paid to him at the regatta in cash in a variety of currencies. He spent the week’s trip with the regatta souvenir bag containing his booty roped to his waist. Since I had an identical bag, I spent the week trying to exchange it for his, unsuccessfully. The pair of us were once guests of the Egyptian Minister of Tourism at the Nile Boat Race, held over Christmas in Cairo and Luxor with crews from Oxford, Cambridge, Harvard, Yale and Cairo universities. Jim and I held a grudge against the New York Times correspondent, whom we had met at Heathrow during a five-hour delay before take-off. We learned later in Cairo that our friend had switched from Egypt Air to British Airways because he had found out that the reason for the delay was a fire on board the Egypt Air plane that had taken out its automatic pilot. But he hadn’t told us in Heathrow that our plane had to follow its nose to Cairo by tracking the Italian coastline. One evening, Jim invited the Oxford crew in his best Egyptian voice to come to our five-star hotel to be interviewed for a prestigious TV programme. They duly appeared in best bibs and tuckers carrying a couple of oars as requested, and we all sat around the lobby waiting for the TV crew. When it never appeared, Jim invited all to the bar and ordered cocktails. It was a very good and long evening – all charged to the room of the New York Times. Jim’s day job at this time was manager of Oxford University’s Iffley Road sports centre. It was in this capacity that he represented Oxford and Cambridge universities during a trip to the 50th anniversary of the Waseda and Tokyo University Boat Race. Crews from Oxford and Cambridge also took part, and the sidebar was that a Japanese clothing manufacturer was negotiating to licence the use of Oxbridge sports club badges on their up-market blazers. This involved the two of us drinking tea with bankers and merchant houses, visiting the mayor of Osaka, and being entertained by geishas and karaoke. It was an incredible week of seeing sights, attending functions, and adventures on the Tokyo metro. By the way, we remembered to report on the race for our newspapers. In short, travelling with Jim was always an adventure, whether in Putney, Henley, Lucerne (see “Hot Times in the Cold War”) or further afield. One fabulous incident in Lucerne occurred one evening at the Ritz-Carlton where Jim sat at the lobby grand piano and broke into jazz classics worthy of Bill Evans. He soon attracted the clientele who were listening to the hotel’s resident, inferior pianist in the nearby bar. Eventually Jim had to flee the irate hotel manager across its grounds. And then there was the journalism. Before he and his writing succumbed to the demon drink and he took himself off for a new life in Thailand when The Times fired him, Jim was a master of perceptive reporting and commentary. He dubbed a British quad as ‘the quad with the plod’ and had to eat his words when they came good. He dubbed another crew ‘the tombstone four.’ He described the double scullers Baillieu and Clark coming down the course ‘like a ruptured crab’, and claimed that Jim Clark never spoke to him again. For a few years, he was a TV commentator on the Boat Race, a thankless task performed from a trailer full of monitors on the bank at Putney. Thus it was in 1978 that a sinking at Barnes caught him on the hop because the ‘live’ camera had been focussed on the other crew. In the words of Frank Keating in The Spectator, ‘when, in choppy seas, poor Cambridge sank mid-stream and, as they gurgled into the deep, television commentator Jim Railton, with daintily prim olde-tyme BBC circumlocution, immortally set the nation in a roar by describing the unfortunate (but to those warm and dry at home hilarious) waterlogging as ‘leading to a dolphin effect which could yet cause a possible drowning situation’. The Dolphin, of course, was Jim’s local in Wallingford. In 2016, Jim and his wife Atinee and son James, who survive him, returned from Thailand to Wallingford. The great Enclosure in the Sky will benefit greatly by Jim’s entrance. RIP. Jim Railton, born 25 December 1935, died 16 August 2017. Arguably the most outstanding track and field athlete in the club`s history to date though is JAN (Jim) Railton. 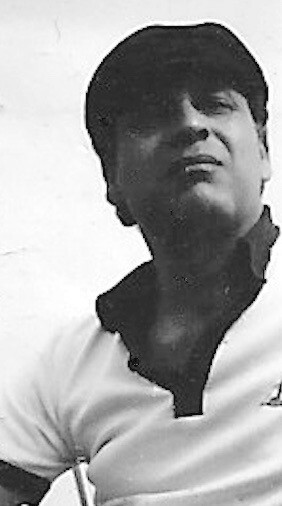 He was nothing short of sensational…. On June 15th (1952) he burst on to the international scene with an amazing performance that was to earn him a `World Sports Certificate’. At the somewhat routine Lancashire and Cheshire Boys Club Championships at Blackpool`s Stanley Park he stormed round the 400m grass track in 49.2. This was the best performance of any Pembrokian to date, Junior or Senior. The 16 and a half-year old had briefly caught the imagination of the sporting world. The piece also records that, in 1955, while Jim was doing his National Service with the British Army in Germany, he ran 60m in 6.7 seconds. It calls this ‘maybe his best performance’ (though, in 1954, he set the British Junior 100 Yards / 91.44 metres record with a time of 9.9 seconds). The full article is here. Nowadays, the national and what remains of the local press has given up on reporting on most rowing events, preferring to fanatically concentrate on a few widely popular sports. The Daily Telegraph alone retains Rachel Quarrell as a specialist rowing correspondent, but, even then, allows her space to cover only the sport’s highest profile events. In Jim’s heyday, it was very different. Looking at The Times online archive, he had 1,519 reports published between 10 February 1970 and 2 March 1990, most with a word count usually around 500, sometimes more, sometimes less. In his first year on The Times, he had 84 pieces published. As an indication of the depth and width of the coverage that The Times allowed Jim, I have compiled a summary of his Times reports for that first year, 1970. February – March: The Oxford – Cambridge Boat Race (twenty reports). February: Head of the River Race. April: Youth Rowing, National Squad Coaching, Scullers Head. May: Wingfield Sculls, The North Sea Regatta, Ostend (two reports), The Oxford Summer Eights (four reports). June and July: Henley (ten reports). June: Reading Regatta, Marlow Regatta. July: Doggett’s Coat and Badge, Lucerne Regatta (two reports), The Youth Rowing Championships, The Bosbann Regatta, Amsterdam (two reports), The National Rowing Championships. July – September: World Rowing Championships (fifteen reports). October: A marathon row, Cambridge University Light Fours (five reports), Oxford University Coxless Fours (three reports). November: ARA Council meeting, Head of the River Fours (two reports). December: Oxford Boat Race Trials (two reports), University of London Trials, Cambridge Boat Race Trials, The Nile Boat Race, Egypt (two reports). 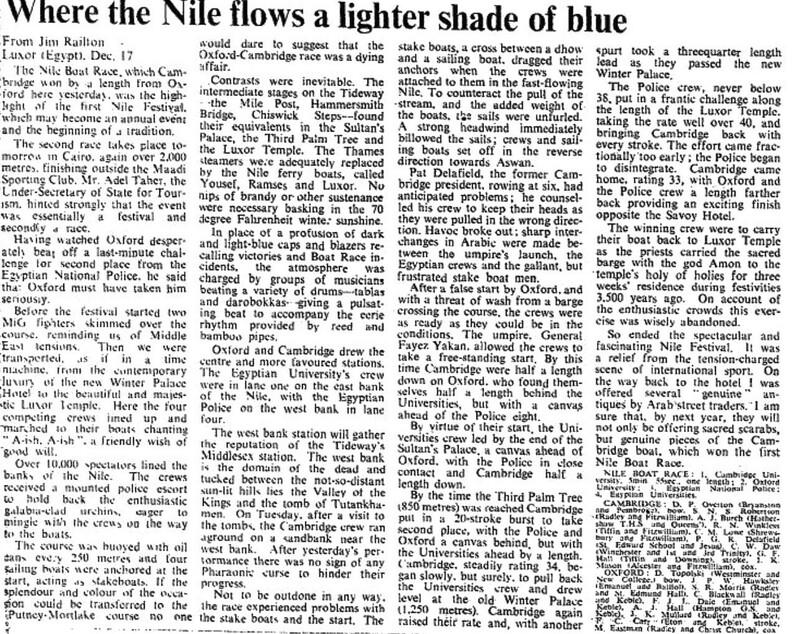 Jim’s report in “The Times” of 18 December 1970 on the Nile Boat Race (click to enlarge). By Jim’s last full year on the paper, 1989, his annual article count was down to 62, an indication of things to come perhaps, but still a long way from the sad current situation (though perhaps not even the most hardened ‘HTBS Type’ would now argue that a national newspaper should publish five days of reports of 400 words each on the Cambridge University Light Fours). It could be argued that nowadays, information on such events as listed above is easily available on the Internet. This is undeniably true, but I must make the unoriginal observation that the great strength and the great weakness of the World Wide Web is that absolutely anybody can write on it: the good and the great, the mad and the bad, the talented and the talentless, the informed and the ignorant. Further, most of us expect to access information on the Internet free of charge, ignoring the fact that nurturing and maintaining real professionalism costs money. None of this is conducive to producing successors to honed talents such as possessed by Jim Railton. May he rest in Peace. Jim was consultant Coach to the Irish Amateur Rowing Union in the late 1970s. Spent several weekends with him on the Lakes in Blessington.